Here’s a great way to work in a serving of fruit for National 5-A-Day Month! 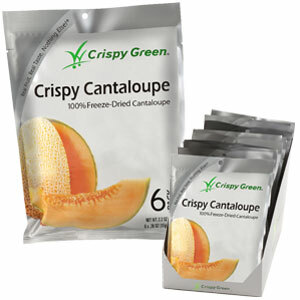 Healthy, wholesome, and just plain yummy – the newest offering from Crispy Green® is Crispy Cantaloupe! Made using all-natural, freeze dried cantaloupe slices, the end result is a crispy snack that is rich in fiber for on-the-go! Crispy Cantaloupe is high in both Vitamin A & C, and does not contain preservatives, fat, cholesterol, or additional additives. At only 40 calories per serving, which is one bag, you can literlly eat the entire package without guilt! All Crispy Green® products are created using a sophisticated freeze-drying process where water is removed from the fresh fruit in a cold (freezing) vacuum condition, leaving behind the true essence of the fruit in a light and crispy texture – the ultimate snack! Crispy Green® is available in Crispy Apples, Crispy Asian Pears, Crispy Cantaloupe, Crispy Mangoes, and Crispy Pineapple. If you are doing any hiking this Fall, Crispy Green® makes an excellent snack to pack that will not spoil! To learn more about Crispy Green®, to locate a retailer near you, or to order, visit www.crispygreen.com.